Deep in the Sugar Man Swamp, Audie Brayburn's rusted 1949 Chrysler DeSoto has become home to raccoon brothers Bingo and J'miah. 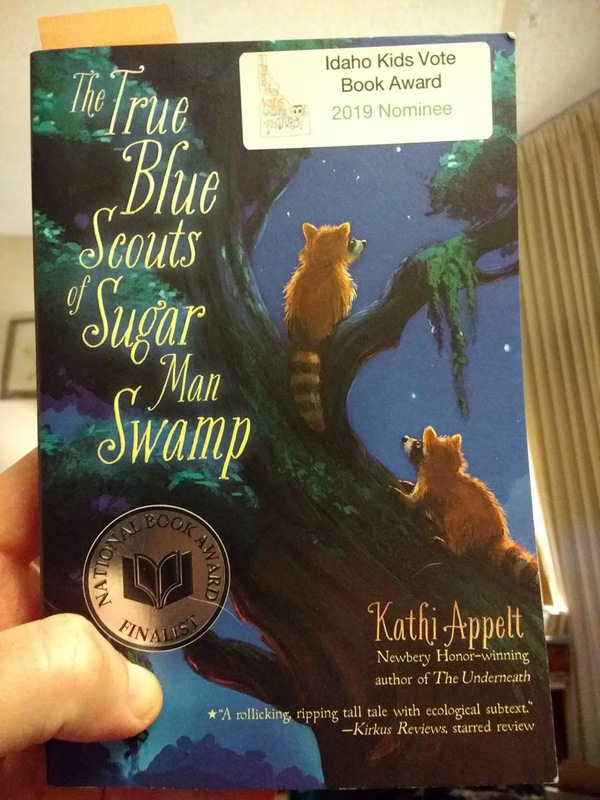 As brand new swamp scouts, their job is to monitor the swamp and wake up the mysterious Sugar Man in the event of an emergency. Their first five days on the job coincide with an ominous rumbling created by an animal threat drawing near. Meanwhile Audie Brayburn's grandson, Chap, is learning what it means to be the man of the house following his grandfather's death. His family's way of life is in danger as their home and bakery at the edge of the swamp stands in the way of a proposed Gator Wrestling Arena and Theme Park. He needs a boatload of cash or a visit from the Sugar Man to stop this human threat. From beginning to end, this was a fun book to read. I really enjoyed getting to know the characters. J'miah's nervousness at Bingo's death-defying tree climbs, Gertrude the giant rattlesnake's itchiness, and Coyoteman Jim's late-night thoughts at the local radio station made the characters feel real. Chap was the star of the story, though, as he longed for a message from his grandpa that would help him save the Paradise Pies Cafe. I was moved by the mixture of hope and longing as he revisited Audie's birding sketchbooks to search for ideas and advice. 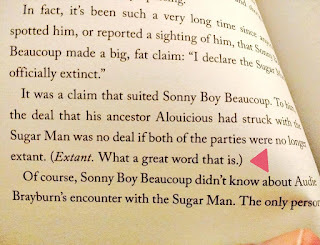 When a book knows it's using terrific vocabulary! As great as the characters were, the author's voice is what really makes this a special book. The frequent perspective changes between the human and animal world are often separated by chapters full of facts about topics ranging from the history of the Polaroid camera to the behavior of alligators that quickly tie in to the story's big picture. In addition, the book often draws attention to its own beautiful vocabulary. 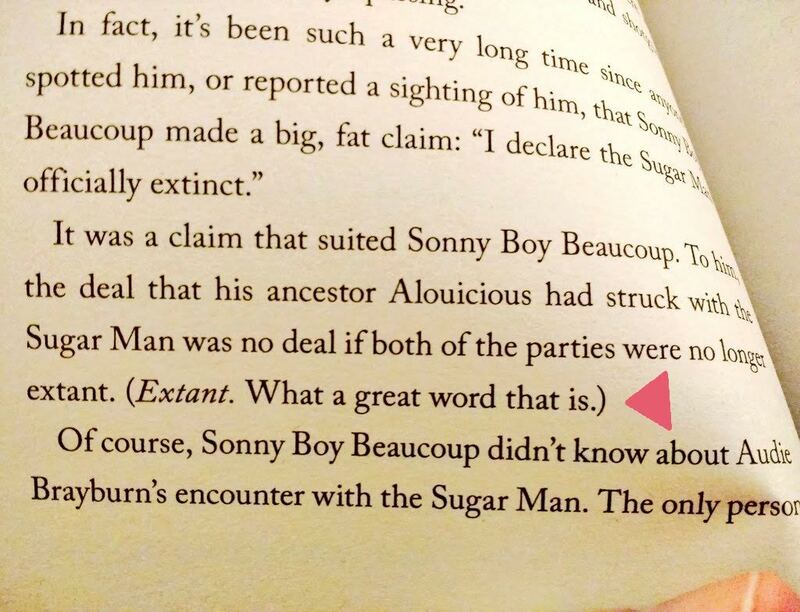 After one character proposes that the Sugar Man is no longer extant the author places the message "Extant. What a great word that is" in parentheses. It's one of many times that the narration pops off the page. This was one of the 2019 Idaho Kids Vote Book Award nominees I had not read before this year's program began. When I started reading, I thought the Deep South setting was an unusual choice for our state book award. Wouldn't Idaho kids relate to a book about life in the mountains better? Even though we don't have bayous, our wilderness faces threats, too. I think the unfamiliar setting gives readers in Idaho just enough distance to consider the message of finding harmony with nature. Not only will that message stick with me, I think the laugh out loud moments and touching relationships in the book will have me remembering the residents of the Sugar Man Swamp for years to come.